What are the relative elements and percentages of the HIV viral genome present in SBI’s lentivectors? 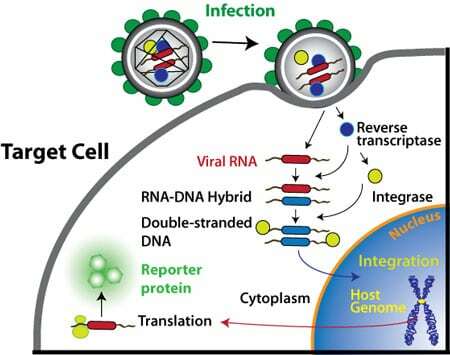 Most cell-types and tissues tested are capable of successful lentiviral transduction. To view a profile of cell lines evaluated, download this PDF.LentiDelivery (PDF). What are the excitation and emission spectra for SBI’s fluorescent protein markers? For the copGFP and dscGFP markers, those data can be viewed here GFP PDF. The Red Fluorescent Protein specifications can be found in this document RFP PDF.